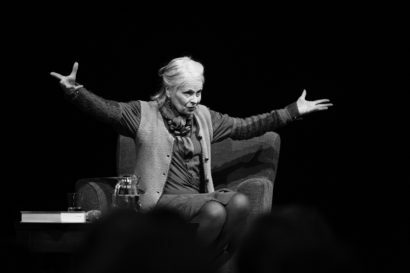 “I had a duty to exploit my talent,” said Dame Vivienne Westwood at the end of this event promoting Get A Life: The Diaries of Vivienne Westwood, answering a question about how she became a fashion designer. She certainly exploited it this evening, leading us – rather unexpectedly for a literature gig – on a guilt trip into swapping to green energy and petitioning the government about greedy bankers. I was feeling guilty already, arriving fashionably late to this event, as I did, then falling down the stairs to claim one of the few spare seats. However, this soon started to dissipate as Dame Vivienne bowled headlong into an hour-long rant about “propaganda = consumption”, with only about ten minutes dedicated to fashion (and this only because an audience member rather naively asked about how the designer started off in the rag trade – although thank goodness they did; it was the most interesting bit). But hang on, there, rewind; isn’t consumption an awful illness beset on people in Strindberg plays? And if you mean consumerism, how do you square being a fashion designer selling expensive pieces to people who have silly money with what you are arguing here? Of course, that’s asked, but politely, by the chair, ethical writer and broadcaster Lucy Siegel, who barely gets a word in edgeways the rest of the time. “You can’t defend [fashion], there’s far too much of it,” says Vivienne, pointing out that we do have to wear clothes. Her message “buy less, choose well, make it last” is worth shouting from the rooftops and she advocates “quality not quantity” and explains that “our work is labour intensive, it’s skilful”, although that’s all well and good if you have the cash to splash on VW gear. Vivienne – incidentally, light woollen red dress over blue sweater, brown sleeveless cardi on top, red and brown stack-heeled shoes – proudly tells us of trips to Kenya, “the elephants!”, and the Arctic, “so beautiful”, with not a flick of an eye for the ironic. It’s fine, apparently, if you, as a big name, go to such places because Greenpeace asked you to and because you were going to make recycled bags with “the people”. She was very proud to have been given a piece of the original Rainbow Warrior’s sail, using the unique blue colour in one of her collections. The Kenyan bags apparently helped the people she worked with “become part of the global economy”. That’ll be the same economy which the flyer we all received told us to kick against. A flyer which, thick paper with a glossy add-on, cost the earth in more ways than one.